Sophomore Samantha Pao, left, grabs a healthy snack on the Palo Alto High School Quad. 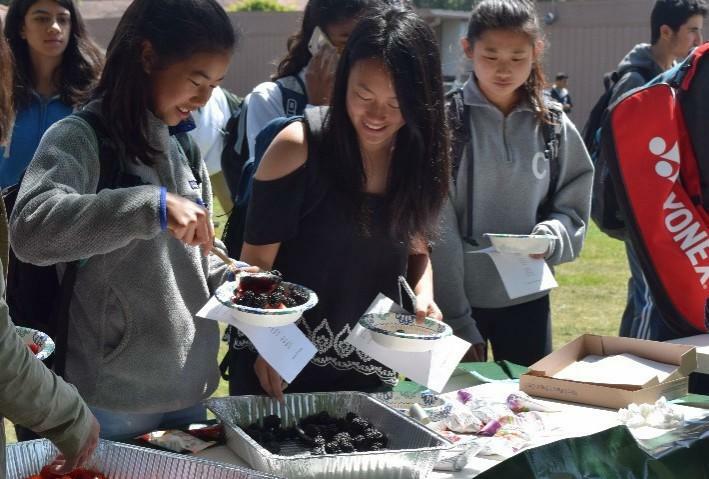 Parent volunteers served locally grown fruit and granola during Day 1 of Change in Our Schools Week, which focuses on stigmatized issues such as mental health and cultural identity that need more awareness at Paly. “Change in Our Schools Week is something that the School Wellness and Climate Committee has been working on that is basically a whole week long full of events during lunch time that focus on changes in our school,” junior Noor Navaid said. Change in Our Schools Week, a week-long series of performances and events on the Quad, looks to bring change to mind at Palo Alto High School by educating students on stigmatized issues such as mental health. A strong opening debut on Tuesday featured music and a dance routine by the Paly K-POP club. Parent volunteers also served attendees locally grown fruit provided by the Parent Teacher Student Association, and members of the Paly juggling club taught students how to juggle. According to CIOS organizer and junior Noor Navaid, Day 1’s theme, “Paly is,” focused on what Paly is as a school. The Bring Change 2 Mind Club, which emphasizes mental health awareness, sold cards called “Wellness Grams” that contained positive messages and candy. According to Navaid, the School Wellness and Climate Committee, which organized CIOS week, is looking to expand the event’s reach. Many of the topics that CIOS week focuses on, such as mental health, are important to discuss because they are difficult to talk about, Salvatierra said. “I think that a lot of times, we have a lot of things to say about mental health, but we’re never given a platform to talk about them, whereas there are a lot of other social issues that are talked about a lot, but mental health is one that’s still super tabooed,” Salvatierra said. According to Navaid, Day 2’s theme will be centered around self-identity.